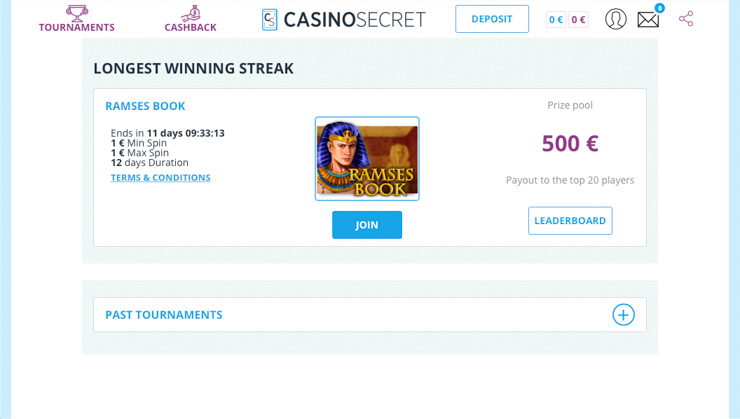 Casino Secret is all about cashback bonuses. If the last thing you want at a casino is a bonus with heavy wagering requirements, then listen up. This casino is giving real money back on your losses. Like on every losing bet. Without a maximum limit; and no wagering requirements. Not at the end of the week or day or when you lose all your money, but right when the reels stop spinning or all the cards are played. Sounds interesting? That’s what this new 2018/19-launched online casino brings to the table. The only caveat – it’s currently available only in Germany, Japan, Finland, Austria and Iceland. Can this casino live up to the expectations? Chances are it will, because it’s co-operated by the same guys as LadyLucks and SlotsMillion, which won the best casino of 2018 award. Sign up here or read the full Casino Secret review, where among other things you’ll learn how its unique cashback feature works, how fast are the cashouts, as well as about game providers and customer service. Let’s start with the hot new-player promotions. Get €/$25 real money cashback on 1st deposit (German example). The Welcome Cashback is an insurance on your first deposit. 🎁 Welcome bonus: Get up to €/$25 back if you don’t win*. *There are no wagering requirements on this offer, meaning the funds will go straight into your real money balance. So, if you deposit €/$50 and lose it all, then CasinoSecret will credit you half of the money back. Max bet on table games and live casino is €10 or $25. Why is this cashback better than a regular match bonus? First because it’s real money and second because you can play any game, even Dead or Alive, Jack Hammer or Bloodsuckers, which are usually excluded from bonuses. 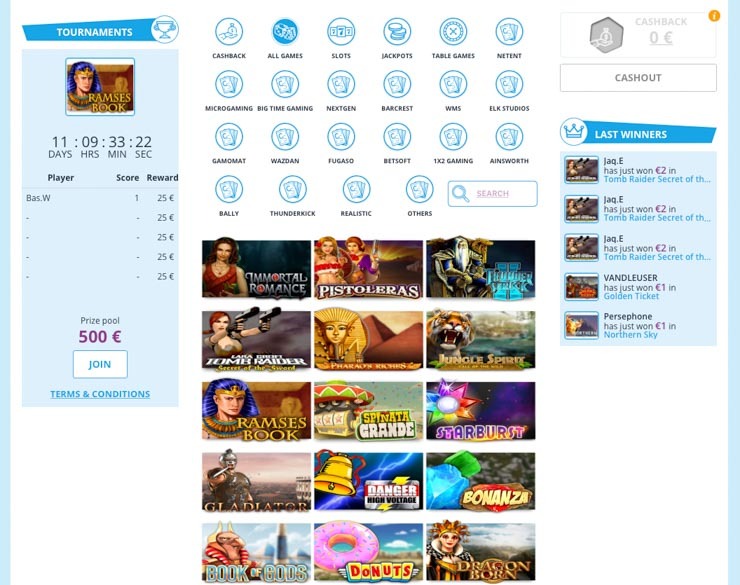 But, if you’re from Germany or Japan and are looking for free spins or a match bonus instead, then I recommend you check reputable casinos like Wunderino or Cashmio. 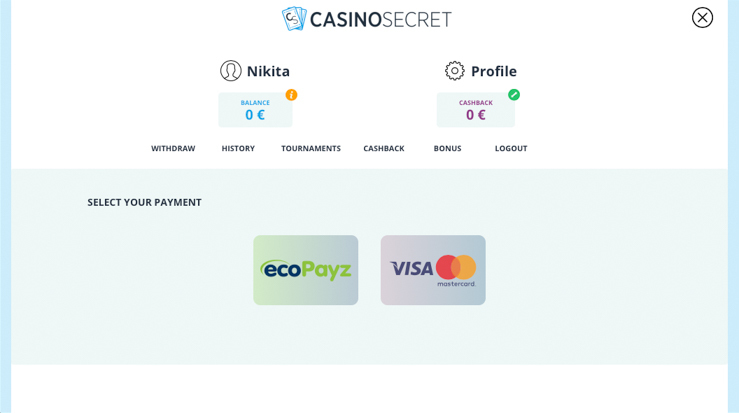 Moving on, here’s how to make your first deposit at Casino Secret. Withdrawals processed within just 1h for verified members. Depending where you’re playing from, you can use localised payment methods that include Visa, Mastercard, SOFORT/Klarna (Germany), ecoPayz, Venus Point (Japan), Visa by Voucher (Japan), and bank transfer. Cryptocurrency is not accepted here, but you can comfortably play with EUR or USD. Their internal payments team also ensures that withdrawals are processed quickly, within just 1h for verified customers. So be sure to upload your documents (proof of identity and residence) quickly in the account section to avoid delays. 👍 Tip: If you’re from Germany or Finland, then you can also play without any registration at these TOP No-Account Casinos 2019. The minimum deposit is €/$10 and the maximum you can withdraw per month is €/$50,000, excluding jackpot winnings. ⚡ Deposit now: Deposit €/$50, get €/$25 back on losses. Is Casino Secret a Scam? Casino Secret is not a scam. It’s regulated by the Malta Gaming Authority, which is regarded as one of the best in the EU, which makes it a safe place to play. It’s also managed by a professional team with experience that has stood the test of time (for both players and affiliates) and is largely known to assist players both on and off their own website. Perfect. So, what can you play here? Play over 1,200 games from 13+ developers. At Casino Secret you’ll find hundreds of games for mobile and desktop gaming. This includes 13 iGaming studios, like Play’n GO, Gamomat, NetEnt, Leander, NYX, Big Time Gaming, Microgaming, Evolution, Felix Gaming, iSoftBet, Oryx, Quickspin, Fugaso. Yggdrasil and many others are also coming soon. That makes for a total of more than 1,200 games, including blackjack, roulette, Sic Bo, Caribbean Poker and more. But, at the time of writing, I couldn’t find any video poker games or Live Casino, which could be temporary but nevertheless a significant missing piece for some players. Slot-wise, you’ll find hit games like Bonanza and Pink Elephants, branded ones like Vikings and Bridesmaids, and progressive jackpots like Divine Fortune and Gamomat slots with Red Hot Firepot or Golden Nights Bonus. Another way to enjoy their video slots is with Casino Secret tournaments. Join for free and win real cash. Every now and then the casino runs races which you can join for free. The tournaments are based on a particular game, have a time limit and a prize pool with a real-time leaderboard with many winners. 👍 Tip: Like casino tournaments? — Then you’ll also like Rizk Races! 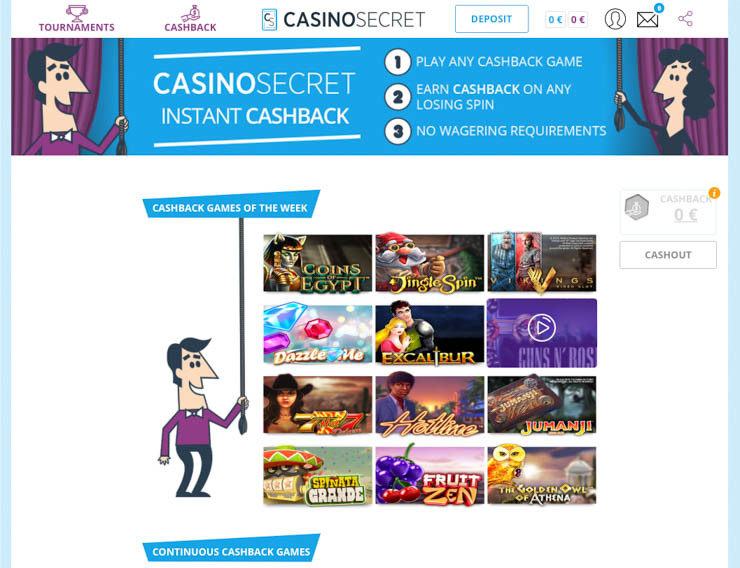 Casino Secret Instant Cashback kicks in only after your 2nd deposit. Cashback is a refund percentage of a player’s net losses over a particular time period. In this case, it’s completely automated so that you get part of your losses back, on every losing spin and not when you run out of your balance completely. For example: You deposit €/$50, lose €/$20 in Starburst and decide to play another game. You just exit the game and get cashback money right away. And just like with the cashback welcome bonus, there are no wagering conditions. How to track your cashback bonus? The easiest is to play on desktop (eg your laptop, PC, Mac), because then you’ll see a sidebar with real-time cashback tracking; including your real and cashback balance. Easy to keep an eye on real-time balance and cashback! Once the cashback balance is above the minimum threshold, you can transfer it to your real money balance just by closing the game. It’s that simple and seems to work just fine too. There’s no catch but two important rules: 1) keep in mind those minimum and maximum limits like for the welcome bonus 2) only games under the Cashback section qualify (that’s about 40 games in total, which rotate weekly). 🚀 Cashback games: See all eligible cashback slots. If you prove to be an active player or high roller, they’ll increase the cashback amount, so that you’ll get even more for every losing bet. That’s the least you’ll get as a VIP. 👍 Tip: If you enjoy cashback bonuses, then be sure to check Thrills Casino’s 10% cashback up to €1,000 promotion (also wager-free). Last but not least, here’s a quick look at Casino Secret’s customer service. 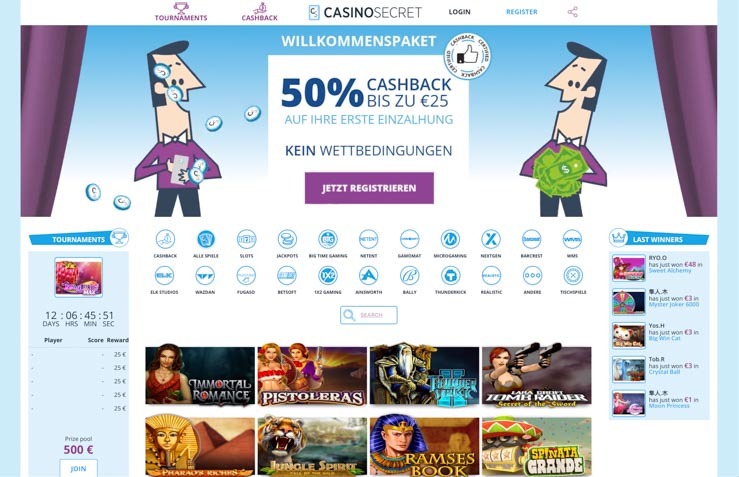 Casino Secret Casino offers customer support in English, German and Japanese. You can contact them via live chat or email between 11am and 11pm CET, including weekends. It typically takes under 30 minutes to respond, so some patience will be required. If you’re contacting regarding responsible gaming features like bet and time limits, then they are also very easy to set up in the player menu when logged in. So, are there any more secrets? Reveal cashback games in the lobby. Casino Secret joined the LadyLucks and SlotsMillion family just recently and with one clear and big mission – change how players get bonuses. Their instant cashback feature is straight-forward and easy to use for everyone, partly because there are no hidden terms and conditions. You just play and if you lose, you’ll get some of your money back, automatically. Welcome bonus – there’s no signup bonus, but you’ll get up to €/$25 back on your 1st-deposit losses, with no wagering requirements. Quick withdrawals – verified players get their cashouts processed in 1h; use payment methods like SOFORT/Klarna, ecoPayz, and Venus Point. 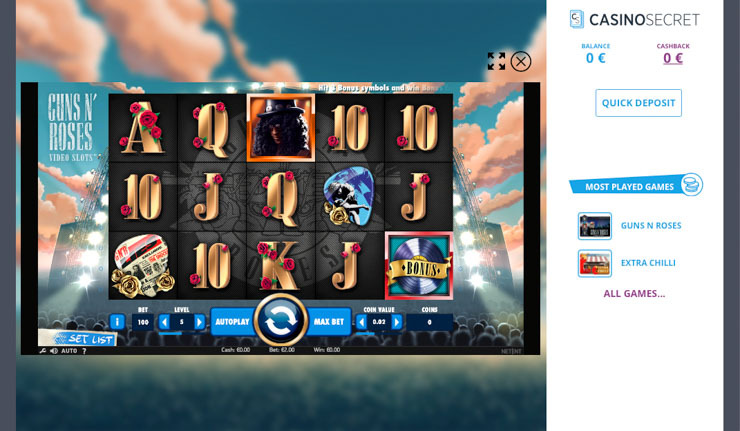 Top games – play hundreds of games from studios like Gamomat, Play’n GO and NetEnt (no video poker or live casino yet). Slot tournaments – join for free and win real prizes with fair rules. Instant Cashback – innovative feature that allows you to get part of your losing bets back without delay. Help – live chat or email, 3 languages, 7 days a week. That’s all you should know to get started. 📌 Verdict: If you’re after simplicity in life and complex bonus rules make you dizzy, then Casino Secret’s cashback program will feel like a major relief. 💸 Play at Casino Secret: Get up to €/$25 in real cashback. T&C: Deposit €/$10 or more and get 50% up to €/$25 cash back if you lose. No wagering requirements. Play any game you want. Max bet on slots is €4 or $5. Max bet on table games and live casino is €10 or $25. New 18+ customers only.